Not all bulletproof backpack inserts are the same. Here’s a rundown of what you need to know when it comes to ballistic backpack inserts. What guns/ammunition will it stop? Will it actually keep me/my child safe? In this article, we’ll look at several bulletproof backpack inserts and share some details about each. We are not here to tell you to buy our backpack insert. It’s totally up to you to decide 1) whether you want or need to buy one and 2) which one is best for you/your child. Most bulletproof backpacks are classified as Level IIIA, which means they will stop at least four rounds from most handguns. The majority of ballistic backpack inserts on the market fall into this classification; they are meant to protect against multiple rounds from 9mm, .357 Magnum, and .44 Magnum ammunition. Be sure to check the Ballistic Lab Report and any NIJ Compliance letters referenced on all websites. We have found that many manufacturers show a lab report or compliance letter that may be for a different product or an outdated NIJ standard. For example, the current NIJ standard set in 2008 is NIJ 0106.01. We have seen several of these backpack inserts noted as NIJ 0108.01, which was the standard set back in 1985 – much has changed since 1985 when it comes to guns and ammunition! Watch our video “How to Read a Ballistic Lab Report” to make sure you’re getting what you think you’re getting. So, what does a Level IIIA backpack insert really stop? In many recent mass shootings, it’s not handguns that shooters are using, but rather high-powered rifles like the AK-47 and AR-15. In order for a backpack insert to stand up against this level of weapon, it must be classified by the NIJ as Level III, a major step up from the basic Level IIIA protection referenced above. Because these high-powered rifles have the potential to do much more damage, the requirement of the number of rounds this level of insert stops increases to six shots. While the majority of bulletproof backpack inserts are rated for handgun protection (Level IIIA), there are a number of inserts that comply with the NIJ’s Level III requirements. Once you start talking about rifle protection for backpack inserts, the construction process and materials used to produce these inserts makes a big difference in weight, comfort, and cost. Because a primary feature of a bulletproof insert is to be thin enough to fit inconspicuously into a backpack or computer bag, there are only a couple of materials that provide rifle protection in the form of a bag/backpack insert – steel and polyethylene. Steel backpack inserts can be very inexpensive, but because they’re steel, they are also very heavy – 8 to 10 lbs. depending on the size. They are also very thin, which is a positive, but 8+ lbs. in a child’s backpack or your computer bag or purse is quite a bit of extra weight. Ultra High Molecular Weight Polyethylene (UHMWPE) is the latest advancement in ballistic material. Polyethylene technology offers the best protection at the lowest weight. These polyethylene inserts provide the same level of protection as their steel competition, but at a fraction of the weight, as seen in the chart above. What Do Bulletproof Backpack Inserts Cost? As you can see from the chart below, bulletproof backpack inserts have quite a broad range of prices, depending on whether you’re considering a Level IIIA soft backpack insert or the thinnest Level III lightweight polyethylene insert for rifle protection. For Level IIIA, there’s not such a wide range in price, so it becomes a matter of evaluating weight and thickness. When looking at the various options we found while searching online, at the roughly 11” x 14” size, the weight and thickness don’t vary considerably either. Does the company appear to be legitimate? Credible? Trustworthy? Can you pick up the phone and talk with a “real person” if you have questions? The price range of rifle-rated inserts is very different from handgun protection. Clearly, steel Level III inserts will be the least expensive (under $100) and thinner polyethylene inserts will cost more. When it comes to buying Level III bulletproof inserts though, the price must be considered relative to the weight and thickness. And, in the case of rifle protection, weight and thickness do vary quite a bit more. A steel insert may only cost $65, but at 8-10 lbs., is doubling or tripling the weight worth saving on the price? For placing in a student’s backpack, in particular, weight is a major consideration. We would NOT recommend going with a steel insert for this reason alone. The various polyethylene (poly) inserts that we found online range in price from $199 to $700; weight ranges from 2 lbs. to just over 5 lbs. (the sizes differ here, so keep that in mind – an 11” x 14” insert is obviously going to weight more than a 10”x12”); and thickness ranges somewhere between .7 inches and 1.1 inches. Traditionally, the thinner and lighter a poly insert is, the more expensive it is. 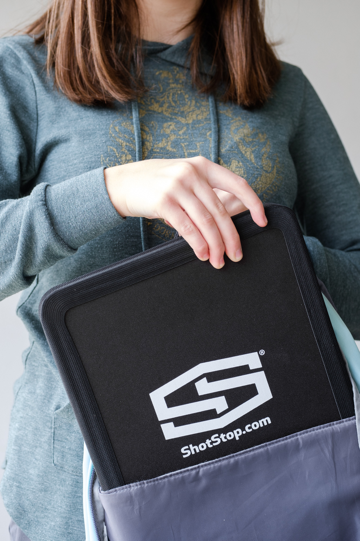 At ShotStop®, we have developed a patented process and material called Duritium® that allows us to produce thinner and lighter inserts while keeping the costs much less than competitors – for example, a 10”x12” insert weighing 2.8 lbs. and 0.7” thick at $299 versus the DFNDR 9.5”x12.5”, 2.0 lbs., 0.7” insert at $600. One other important thing to consider is WHERE the backpack insert is manufactured. “Made in the U.S.A.” doesn’t necessarily mean that a product is 100 percent made in the United States. Certain components could be manufactured in foreign countries and then final production takes place in the U.S. Products that are Berry Compliant, however, fall in line with the Berry Amendment (first introduced in 1941), which requires the Department of Defense (DOD) to give preference in procurement to domestically produced, manufactured, or home-grown products. Essentially Berry Compliance helps promote the purchase of U.S. goods over other foreign-made goods – and it also ensures that a product is 100 percent made in the U.S.A. Many ballistics companies that sell bulletproof backpack inserts are selling products that are wholly or partially made in China, where manufacturing standards are not nearly as stringent and consistent as in the United States. To ensure you’re getting a product that stands up to the rigorous standards you should expect from anything that is supposed to stop bullets, check to see if the company is Berry Amendment Compliant. Do Bulletproof Backpack Inserts Really Keep Our Kids Safe? So, the big question covering all the questions we’ve addressed so far is this: DOES A BULLETPROOF BACKPACK INSERT WORK? Will it protect my child or me? The purpose of a bulletproof backpack insert is to keep your child safe in an active shooter situation. We can talk all day about the number of shots an insert is rated to stop, how thin or light it is, but if it is not available to the student or isn’t properly used, it won’t be good for anything. Any backpack insert should be placed in the back of the bag; this also takes advantage of the added benefit of anything else in the bag being hit first, thus improving the effectiveness of the insert. As shown in the illustrations below, the backpack should be held in such a way that it covers the head and chest. A question that comes up often is, “What if the kids can’t or don’t carry their backpack throughout the school?” This is a very good question. Different schools have different rules, but in some cases a child’s backpack may be in a locker, out of reach in an emergency situation. An option for this is to keep the ballistic insert nearby inside a desk or with a stack of books on the desk. For middle and high school students who may carry books outside a backpack from class to class, the insert can be included in that stack of books. Again, this is where thickness and weight become very important. By no means is a bulletproof backpack insert the ONLY solution to keeping our kids safe in school and ourselves safe at work or in public areas. There are many other ideas, products, systems, and education that will help keep our kids safer in school and make public areas safer. A backpack insert is a single measure that provides both protection and peace of mind and should be used in conjunction with open communication with your children, their school, and the administration of a school district. We often use the analogy of a fire extinguisher. Every public building in America is required to have one or more fire extinguishers on site. This is not a requirement because the government expects every building will have a fire, but it’s in place in case there is a fire, there’s a much better chance of saving lives when a fire extinguisher is available in the event a fire does happen. The same is true for the bulletproof backpack insert: we all hope it is never needed; if an active shooter situation DOES happen, however, there’s a much better chance of survival if the right protection is available. We’ve shared a lot of information here, and hopefully you feel more educated about the options available when it comes to bulletproof backpack inserts. We saved our most important piece of advice for last: DO YOUR RESEARCH! Don’t get caught up in the fear of the moments following a mass shooting event, but rather explore your options and make the decision that works best for you and your family. We will do our best to keep the data in the article updated, but things change – prices, weights and other specifics may get updated. In fact, we know that the NIJ is in the process of launching a new standard, likely to go into effect by 2019. So, don’t rely on just one source; do your research and let us know if we can help with anything. ShotStop® Ballistics is developing the lightest, thinnest, and strongest advanced armor technologies in the world. From body armor plates and armored vehicle protection, to its innovative BallisticBoard® material and custom armor solutions, ShotStop Ballistics is leading the way in improving the protection of our police, military, special forces, S.W.A.T., security personnel, and more. With technical expertise that spans more than 35 years (see http://www.VallmarEngineering.com), the ShotStop team brings together engineers, Ph.D.’s, chemists, product developers, and ballistic specialists, to create ballistic technology that saves lives, reduces physical encumbrance, and maximizes performance. ShotStop consistently uses independent and federally accredited ballistic labs, including the Department of Defense and National Institute of Justice, to ensure ShotStop armor provides our servicemen and women with the best possible protection. Call 800-986-0795/330-686-002 or click here to learn more.